The endocytic compartment is not only the functional continuity of the plasma membrane but consists of a diverse collection of intracellular heterogeneous complex structures that transport, amplify, sustain, and/or sort signaling molecules. Over the years, it has become evident that early, late, and recycling endosomes represent an interconnected vesicular-tubular network able to form signaling platforms that dynamically and efficiently translate extracellular signals into biological outcome. 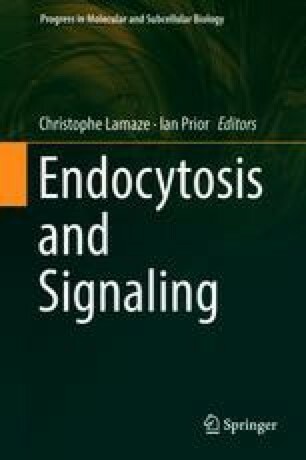 Cell activation, differentiation, migration, death, and survival are some of the endpoints of endosomal signaling. Hence, to understand the role of the endosomal system in signal transduction in space and time, it is therefore necessary to dissect and identify the plethora of decoders that are operational in the different steps along the endocytic pathway. In this chapter, we focus on the regulation of spatiotemporal signaling in cells, considering endosomes as central platforms, in which several small GTPases proteins of the Ras superfamily, in particular Ras and Rac1, actively participate to control cellular processes like proliferation and cell mobility.